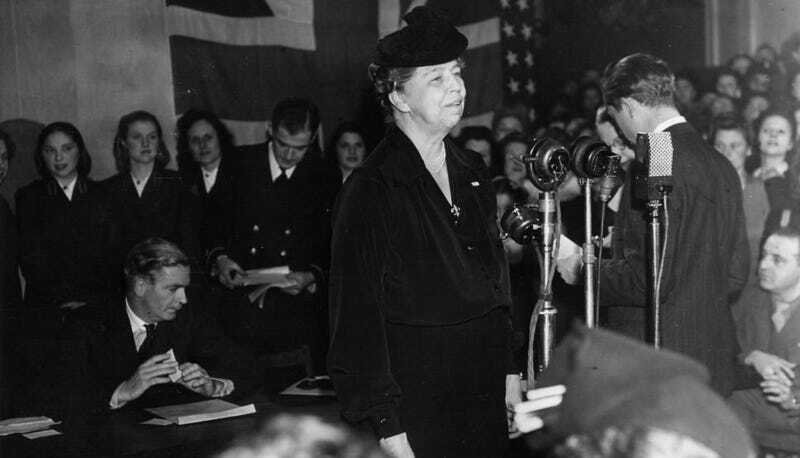 Eleanor Roosevelt is the Greatest First Lady of all time, according to a new survey of historians. According to a survey of 242 historians and political scientists, Eleanor Roosevelt is still the best First Lady of all time. In over 30 years of polling by the Siena College Research Institute, Roosevelt has held the top spot each of the five times that the FLOTUS poll has been conducted, edging out Abigail Adams, Jackie Kennedy, and Dolley Madison. Michelle Obama and Hillary Clinton devotees, be not discouraged, the two women finished fifth and sixth, respectively. Barbara Bush (11) and Laura Bush (12) rounded out the top twelve. Pollsters asked 242 historians and political scientists to rate 38 presidents' wives in 10 categories such as "courage," "integrity," "value to the country" and "accomplishments." Current first lady Michelle Obama scored particularly high in the categories of "being her own woman" and "value to the president." Her weakest area was seen to be in her capacity of "being the White House steward." [Ascribing] these principles by rank to women serving in an undefined political role over the course of more than two centuries feels more like a fool's errand. For example: Jane Pierce, who came in dead last in the poll, was a one-term First Lady known for her bad health and ambivalence about politics and public life. Her time in the White House was also spent grieving for her son Benjamin, who died in a train crash two months before her husband Franklin Pierce was inaugurated. On the other hand, Dolley Madison, who already earns high marks, was something of a pioneer in the role of First Lady. In addition to helping to define some of the duties and traditions of First Ladies that endure today, she also stood in as Thomas Jefferson's First Lady during the eight years that her husband served as Jefferson's Secretary of State. That's 16 years! Yeah, so lay off Jane Pierce, you Jane Pierce-hating Society of Anti-Jane Piecers people, you. Reuters notes that historians don't agree on when we first started to use the term "First Lady;" however, it was not, as many unaccredited, untrained and totally unprofessional historians speculate, first used in reference to Donna Summers as the "First Lady of Disco." That is wrong and probably shouldn't be in any of your history books. Here's the complete survey spreadsheet with breakdown of how they all did, for those of you who like to obsess over hundreds of tiny numbers stacked in columns.